I have been playing tennis for more than 20 years. I love the sport and love organizing players to compete on local leagues. Some might say that I live and breathe tennis. I guess I do! Aside from my job at Virginia Beach Tennis and Racquet Club, I am a Board member of the Virginia Beach Tennis Patrons Association, and the coordinator of many USTA leagues and World TeamTennis in Virginia Beach. As a league coordinator, I am asked many questions on league rules, tennis rules, and how to become involved in this great sport. This site is intended to help answer those questions and be a resource for your tennis needs. If there is something that is not addressed, please email me. 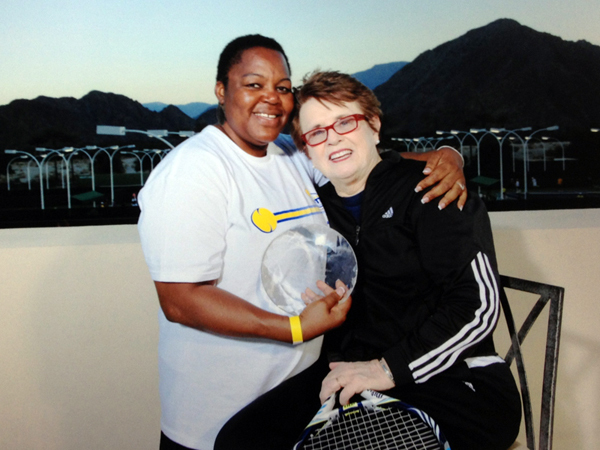 Claudette Sealy was presented with the WTT 2012 Delaine Mast League Coordinator Of The Year. A huge honor in the tennis world, The Delaine Mast Award was established to recognize a male and female League director who contributes to the growth of tennis and WTT, as well as being a leader and role model in his/her local tennis community.